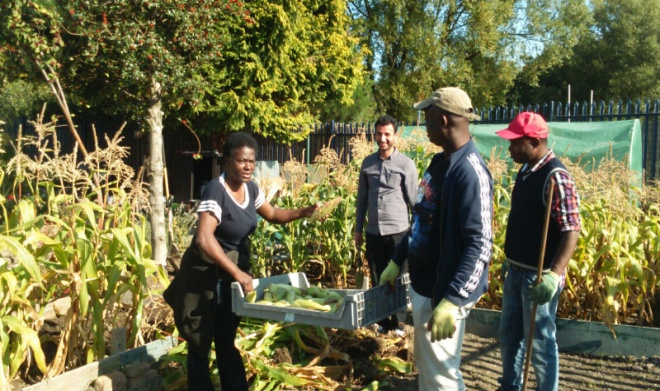 The Revive Allotment project is one of our therapeutic projects which has become attractive to refugees and asylum seekers, as well as the host community. Our clients and members of the community come to the garden to grow veggies, fruit trees, flowers, make scented oils from herbs. fresh home grown food produce. acquire some gardening skills and learn how to make healthy meals. meet people with a common interest, and the sharing of activities make for interesting friendships which break age, religious and ethnic divides. Those facilitate positive community cohesion and integration in the society. Besides the benefit of fresh air, home grown produce, healthy lifestyle and like-minded people that allotment gardening offers, having a hand in a new beginning is very therapeutic to the human spirit wondered by life’s harsh experiences. There comes the natural surprise in discovering that the human spirit is like a spring garden. If growth is to happen, it too must be made ready: pulverised, opened and manured, for growth and goodness to emerge. All those help in one’s journey of recovery, and integration into the community.